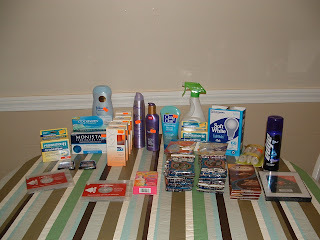 Frugal & Fabulous: Walgreens - Hello Clearance Aisle!!!! Walgreens - Hello Clearance Aisle!!!! 5 - K Y Warming Lubricants (Lord I hope my parents aren't reading this) clearanced to $1.87 (used a combination of $2/1 and $3/1 any KY product coupons) = too early for all that math = OVERAGE! 1 Monistat Cooling (not sure when I'll use this, but whatev) clearanced to $3.74 used $4/1 Monistat product = -26 cents! 1 Prep H wipes ($4.49) used $3/1 MFC and $2/1 Easy Saver Coupon = -51 cents! 1 Clean and Clear Cleanser with oxygen bubbles ($1.82) used $2/1 Clean and Clear = -18 cents! 1 - Johnson and Johnson Shower and Shave soft wash (c @ $1.49) used $1 any Johnson product = 49 cents! 1 - Olay Age Defying Moisturizer (c @ $2.62) used $2/1 coupon = 62 cents! Also pictured: Zipfizz from CVS, and 2 free Redbox movies! Thanks to Justine for posting the codes every week!